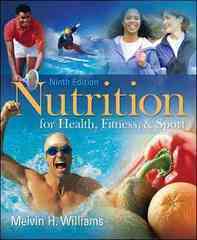 Nutrition for Health, Fitness & Sport 10 Edition Nutrition for Health, Fitness & Sport, now in its tenth edition, provides the reader with thorough coverage of the role nutrition plays in enhancing one’s health, fitness, and sport performance. Current research and practical activities are incorporated throughout.This edition welcomes the addition of two new authors, Dawn E. Anderson and Eric S. Rawson, both of whom are actively involved in the disciplines of exercise physiology and sports nutrition, and who have used this textbook over the years to teach their university classes.The tenth edition includes incorporation of the new Dietary Guidelines for Americans and the associated MyPlate model that has replaced the MyPyramid model. The new MyPlate model, which was designed to be more user-friendly for the American population, is discussed in several chapters. New information from authoritative position statements dealing with exercise and nutrition issues has been incorporated in various chapters where relevant. More than 300 new references, including clinical studies, reviews, and meta-analyses, have also been added to the text.